All summer long, New York City is filled with beautiful flowers and gorgeous scents. Mommy Poppins' resident naturalist Leslie Day has put together this guide of local wild flowers for you to look for as your explore your streets and parks and some background science so you can turn a walk in the park into a teachable moment. 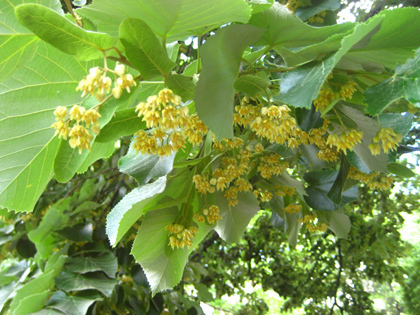 Everywhere you go on the Upper West Side and on streets that have these lovely trees throughout the five boroughs, you smell the heavenly scent of linden tree flowers. Show your children the leafy bracts that each flower cluster is attached to. When the flowers produce seeds, these modified leaves carry the seed clusters to the ground like little helicopters. At night, when you emerge from the subway, you are greeted with this heady perfume. Follow your nose! 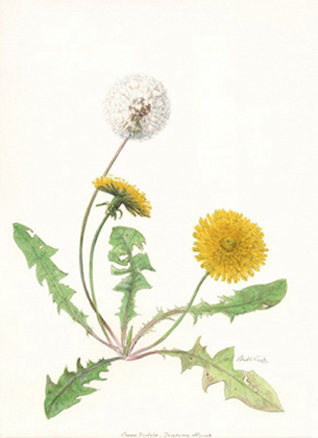 There are many wildflowers blooming in our parks and along our streets – including the common dandelion! Children love these bright, yellow, compound flowers. Look closely and you will see many tiny ray flowers making up the flower head. Each flower produces a tiny seed that is carried by the wind by the flossy white parachute attached to it. Children love to blow the seed heads and watch the seeds carried away by their windy breath. While leading a group of teachers from Brooklyn and the Bronx through Jamaica Bay Wildlife Refuge last Saturday we were thrilled to see the only cactus that grows in New York City flowering! 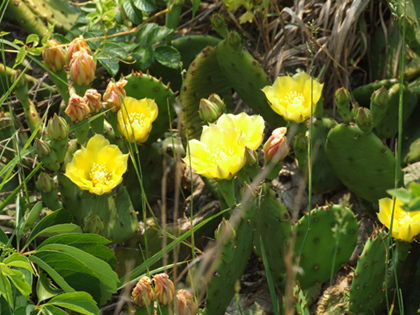 The prickly pear cactus can be found on the West Pond Trail along Jamaica Bay. Prickly pear cactus needs desert-like conditions in order to grow. The sandy soil along Jamaica Bay is ideal habitat for this beautiful plant, which produces an edible fruit, loved by birds and humans alike. Riverside Park South is filled with wildflowers that return each summer. One of my favorites is the moth mullein. Considered by some to be a weed, I just love this beautiful flower now blooming in Riverside Park South and other places in the city. 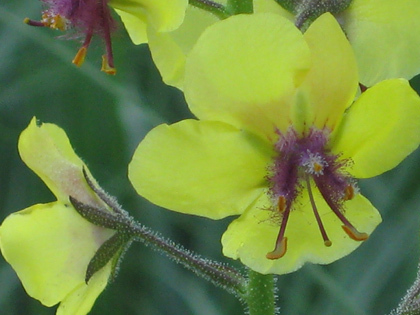 Named moth mullein because the purple and yellow male reproductive parts, called stamens, look like the delicately frilled antennae of moths. Early American settlers brought this flower over from Europe and it has spread across the country. The flower stems are covered with tiny hairs. Multiple flowers are attached to a very tall stalk – sometimes up to 5 feet! 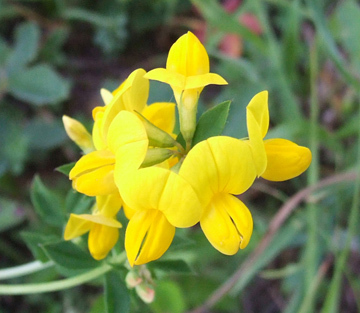 Another wildflower brought over from Europe and blooming all over our city parks, is the lovely yellow flower, birds-foot trefoil, named for its slender seedpods that resemble a bird’s toes. The flowers look like pea flowers and are part of the legume family. This is an important family of plants because nitrogen-fixing bacteria live on their roots and do the incredibly vital job of taking nitrogen from the air pockets in the soil and putting it near the plants roots so that plants can absorb it. This is how plants take in nitrogen, and how we get our nitrogen – from the plants we eat. And now for a pink flower: Common Milkweed! 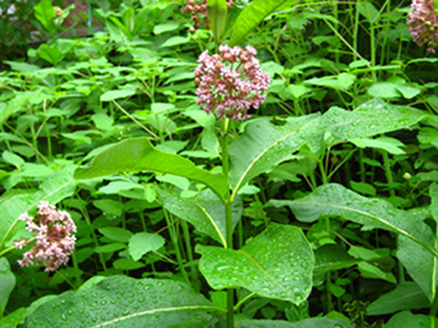 Growing along the paths of Jamaica Bay Wildlife Refuge and throughout the parks of the 5 boroughs, you will find the very important host plant for the monarch butterfly caterpillar, the gorgeous and aromatic common milkweed. Each summer monarch butterflies migrate back to our city and find the common milkweed patch they emerged from when they climbed out of their pearl-white egg that their mother laid on the underside of the milkweed leaf. Munching their way to a full-sized caterpillar by consuming leaf after leaf, the caterpillar then hangs upside down and within a couple of weeks emerges from its gorgeous emerald-green chrysalis as a large, black and orange butterfly, and proceeds to feed on the nectar of the common milkweed’s flower. Having fed on the toxic milkweed leaf as a caterpillar, the butterfly is mildly poisonous to predators and is avoided by birds. Turn leaves over and look for the delicate, tiny white eggs. In Latin, rugosa means “wrinkled” referring to the texture of the leaves. 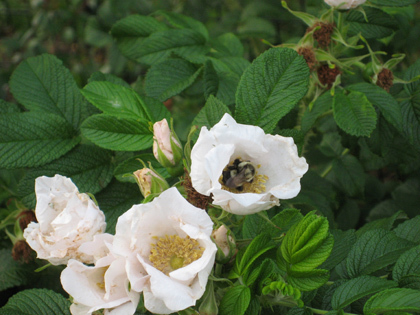 This common rose attracts pollinating animals like the bumblebee rolling around in the center of the top rose in this photo. Usually bright pink and sometimes pale pink or white as seen above, the rugosa rose produces a fruit called a rose hip, which provides a nutritious food for wildlife throughout the winter. Rugosa rose grows throughout Riverside Park and Riverside Park South. Look for it in a park near you throughout the city. Leslie Day is an environmental and life science educator at The Elisabeth Morrow School and an adjunct faculty member at Bank Street College of Education. Leslie created and taught the City Naturalists Institute for Teachers program for the Central Park Conservancy. She has a doctorate in science education from Teachers College Columbia University. Leslie Day is author of the Field Guide to the Natural World of New York City and writes a monthly column for Mommy Poppins educating families about the natural and wild life in New York. Leslie and her husband live in a houseboat on the Hudson River in Manhattan.